“The Ayatollah consistently believed that we are untrustworthy, that you can’t negotiate with us, that we will screw them,” US Secretary of State John Kerry told Jeffrey Goldberg. 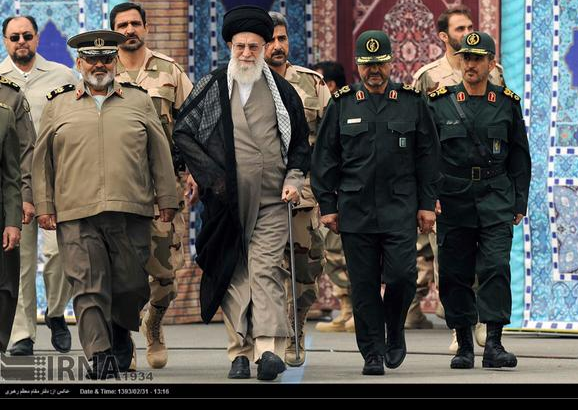 If the US Congress rejects the deal signed on July 14, then Iran will be humiliated and the Ayatollahs unhappy. They will be ‘screwed’ in his terminology. “The United States Congress will prove the ayatollah’s suspicion, and there’s no way he’s ever coming back. He will not come back to negotiate. Out of dignity, out of a suspicion that you can’t trust America. America is not going to negotiate in good faith. It didn’t negotiate in good faith now, would be his point.” The interview is interesting because it reveals the entire hand of the US administration’s talking points on the Iran Deal. Kerry presented several other aspects of the narrative they have been feeding the press. If the deal is rejected then the “moderates” leading Iran will be in “serious trouble.” This is interesting in light of the fact that it was announced this week that Mahmud Ahmadinejed, the “extremist”, is seeking a comeback. So if the “good cop” of the Iranians doesn’t work then the US will only get the “bad cop” in the future. What is particularly interesting is that Obama has referenced the “drumbeat to war” that led up to the invasion of Iran in 2003. Obama is the one talking about war the most. At the American University he told guests that “rejection of the deal will lead to war.” Where did the war narrative come from? It emerged only around the time of the signing of the deal. More than a year ago before the deal, as the 18 months of negotiations dragged on, missing deadlines, there was no discussion of war. 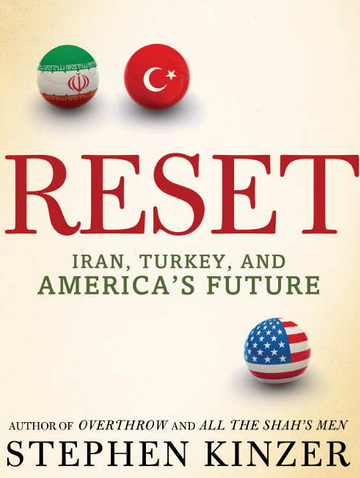 But as they became more frenetic, then suddenly the main narrative became “rejection of the deal means war.” This is particularly ironic since during the almost 2 years of negotiations the US and Iran were becoming closer allies in the Middle East. In June of 2014 John Kerry told reporters that the US and Iran could end up working together in Iraq, especially to confront Daesh (ISIS). The emergence of Daesh got Iran and the US on the same page in Iraq and partially in Syria. John Kerry had said at the time, he “wouldn’t rule out anything that would be constructive to providing real stability….I think we are open to any constructive process here that could minimize the violence, hold Iraq together — the integrity of the country — and eliminate the presence of outside terrorist forces that are ripping it apart.” Since that time, as the 62-nation coalition against ISIS was ramped up, the US began to train Iraqi troops again, and reports emerged that it was sharing army bases with Shia militias that are supported by Iran. So when the US administration talks about war, this is in fact the exact opposite of the more cordial relations the US has cultivated with Iran in the last few years. The US has been fully attempting a ‘reset’ as it did with Russia, and with Cuba; much like that described in Stephen Kinzer’s 2011 book of the same name. When you look deeper into the “Iran deal or war” narrative you find an identical White House media blitz that led to the Iraq war. The administration wants to pretend it is the opposite, but actually the same dog-eared simplistic narrative is at work. WMD was largely a myth used by the Bush administration to convince the US that the American people should support an invasion of Iraq. The theory that Iraq was supporting terrorism was also put forward. Now the myth of “war” is being used to distract from what is actually happening. Consider a few of the ironies of the talking points about the deal. On the one hand the concept is that negotiating with Iran is similar to what Nixon did in China. But when Nixon negotiated with China he didn’t claim that China was so war-like that if the US didn’t open up to China then China would threaten America’s enemies, and that it’s “hardliners” would take over and the US would have to go to war with it. In the opposite the US president’s visit to China was feted, and Nixon with received with honor. Nixon got along famously with the Chinese and they respected America. Not so with Iran. Iran has never admitted any wrongdoing. While Kerry speaks of always needing to worry about the “dignity” of the Ayatollah, the Ayatollah has never given the US any respect or dignity; in the opposite Iran constantly berates the US, boasts of how it is winning, and burns US flags while it encouraged crowds to chant hate-speech against America. So the ‘Times’ is correct that negotiating with adversaries is a good thing; but not when the negotiations are at the end of threats and the view that absence of negotiation means war. Instead negotiation comes when both sides seek peace and when both sides treat eachother with dignity. 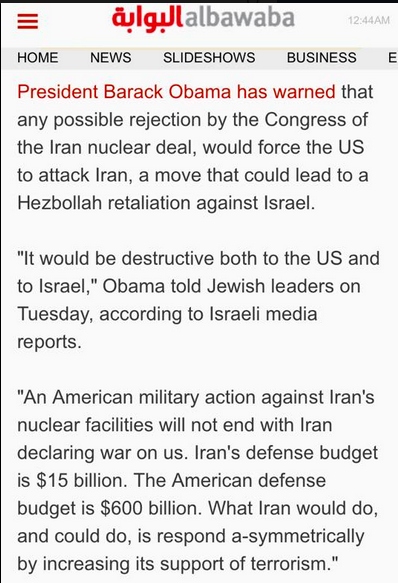 Iran’s negotiations are all about threats. Threats to the US, threats to become “hardline”, the use of a “good cop, bad cop” strategy, and open admission that the “absence of a deal means rockets on Tel Aviv.” This is entirely an Iranian narrative. They threaten to attack Tel Aviv, they threaten to walk away and become more extreme, when in fact they are already extreme and cannot become more extreme. If that were true, namely that the deal itself is supported by everyone and that it is so strong, then why resort to the fearmongering about war; telling CNN that Obama has said that if the deal is rejected then sanctions will fail and then Iran will build a nuclear weapon anyway. That may be true, many reports note the sanctions are already crumbling. So the US is still clutching at straws about some modest form of inspections even as Iran “sanitizes” sites like Parchin that might be inspected and creates a cat-and-mouse style game that makes the Iraq WMD inspections of the 1990s look ironclad. So if the sanctions are evaporating, if the US and Iran are already working together in Iraq and Syria against Daesh, if the US has already accepted that Assad will stay in power having climbed down from its 2013 threats to bomb him, and if this is a deal that guarantees non-proliferation, and only Israel is against it, then why resort to discussion of war? Why talk about the need to preserve Iranian “dignity”? Iran should be considering preserving the dignity of the people of Syria whose lives it has helped destroyed or its own people, whose lives have been destroyed and some of whom feel sold out by the lack of support for democracy by the US. But why does the US need the Ayatollahs to feel good about themselves? Yes, this deal is about a legacy for the US administration. It is about saying they got it done. But why should the public buy into the war story? 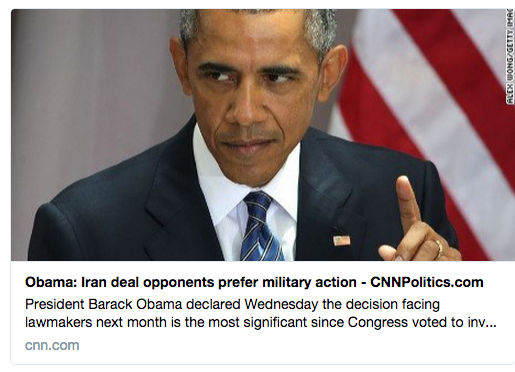 This deal is the Obama administration’s version of Bush’s WMD.